Above, our Bird of Paradise with seven blooms in early summer. 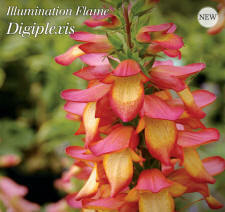 Below, the Digiplexis ‘Illumination Flame’ is still producing more new flowers. Author photos. It is that time of year again—how did it roll around so fast? I am writing about fall, or autumn, of course! Actually it is only forecast to go down to +6o C. tonight (the same as last night) so the Digiplexis and others were back outside yesterday and today! We have not planted any bulbs (not even daffodils) yet this year but there is still plenty of time for them this month. We’ll likely get some bags of tulips, crocus and alliums to be planted in November. You should also consider checking any nursery and garden centres nearby for plants to add to your garden. Fall is one of the best times for planting almost everything, and the prices at most such centres are often 25 to 40% lower than they will be next spring. There is no rush to obtain any of these materials except you might miss out on something you really want if you do not go soon. As for planting, for most items, the later in the fall season that you do the planting, the better. Certainly all deciduous trees, shrubs and hedges should have lost nearly all their leaves by the time you plant them. And what about our lawns, I can hear someone asking! Well, fall is the best time to work on your lawns too. The application of a good quality fall lawn food is the first priority, but do pay attention to the instructions on the fertilizer bag. Some fall fertilizers are best applied anytime now, while others are designed to be applied later in the season. And then there is the matter of weeds. Now that it is cooler they will be more difficult to kill using products such as 2,4-D and Roundup. But you should not let that stop you from trying. If you have large spots either after killing out the predominant weeds, or even just as a result of poor growth during the earlier seasons, consider seeding them, or patching them with pieces of sod (obtainable from your favourite garden centre). If you decide to go the seeding route, be sure to choose a high quality seed from your garden centre, and it will be best to cover the seeded areas with a thin layer of fine soil or sand. Otherwise the birds could eat all of your seed. If you do seed, I would try to get the seed to germinate before winter really sets in. That means absolutely keeping the seeded areas always slightly damp either from rain, or your hose and sprinkler. Do not allow your seed to dry out not even for a part of a day. Actually I could have said the same for sod—it too must never dry out if there is a dry fall. With sod, not allowing it to dry out means daily watering for the first few weeks is a must. Now, for a few moments let us think a bit about herbaceous perennials. Fall is a good time to plant (or transplant) most perennials, particularly including peonies. If you are transplanting perennials from another spot in the garden, cut the foliage back just a bit, If it is new plants from a garden centre, they should be all right just planted into your soil without any other treatment. There are some perennials that will simply not live over the winter without some extra protection, such as a covering of leaves from your own garden. Still other items need to be taken out of the soil and stored in a partially heated garden shed or equivalent. I refer to such plants as tuberous begonias, dahlias and other summer bulbs, as well as any other perennials which have died on you in previous winters. If you have a garden pond, the non-hardy plants such as water hyacinths, water lettuce and ever so many others should be brought into a slightly heated greenhouse for the winter. Hardy water lilies should be lowered to the bottom of the pond (if they are not there already). Water heaters in a circular form can be added to the pond. These will keep a small area of the surface ice from forming (the diameter of the heater) so that fish will always have access to fresh air all winter. Do not forget to keep a small pathway clear of snow from your back door to your composter or compost heap so that you may continue to add organic materials all winter. Growing winter vegetables is an entirely separate topic. If you wish to consider the idea, I suggest you check out some of the various websites that cover this topic such as bcfarmsandfood.com.